Quiet Relaxing Waterfront Swiss Chalet- Fall/Winter Weekly and Monthly Specials! This spacious, airy and relaxing 4 bedroom Suisse chalet, with a beautiful loft, which provides a breathtaking view of the waterfront, sits on Mill Creek just off of the Chesapeake Bay and the Severn River. Located on Mulberry Hill Road, Annapolis, Maryland this beautiful and secluded Suisse Chalet is located 5 minutes from the United States Naval Academy, the community of West Annapolis and downtown historic Annapolis, State Capital of Maryland. Conveniently located 30 minutes from Washington, D.C. or Baltimore, Maryland, this waterside home is ideally suited for water travelers as it has docking for two boats and the deep water is perfect for crabbing and fishing. This waterside home is a great place to unwind, watch the sun rise, lounge, enjoy family outings, or simply entertain guests in a relaxing environment on the spacious deck while firing up the grill! The house is fully equipment with all the modern conveniences of home. The kitchen is fully equipment with new modern stainless appliances. water. Five minutes away, leisurely shopping can be enjoyed with a stroll down Maine Street in historic downtown Annapolis to find antique shops, exotic coffee and tea houses, and a host of international and seafood restaurants. Visit West Annapolis, four minutes away, to find bike rentals, a spa retreat, art studios, and more antiques spots! If your family loves the outdoors they will love this property! Two minutes away is Jonas Creek where they can rent a kayak or paddleboat or just go swimming! Hiking and biking is an awesome year round activity on the gorgeous trails which start just three minutes away. Miniature golf and a golf driving range is 10 minutes away on Route 2. Golf courses are close by in the area. Orioles at Camden Yard, Ravens. Lots more to do and see in the City. performances at the Kennedy Center. Event rates available upon request. 5 minutes from downtown Annapolis and historic Maine Street with shops and bistros overlooking the scenic Annapolis Marina. 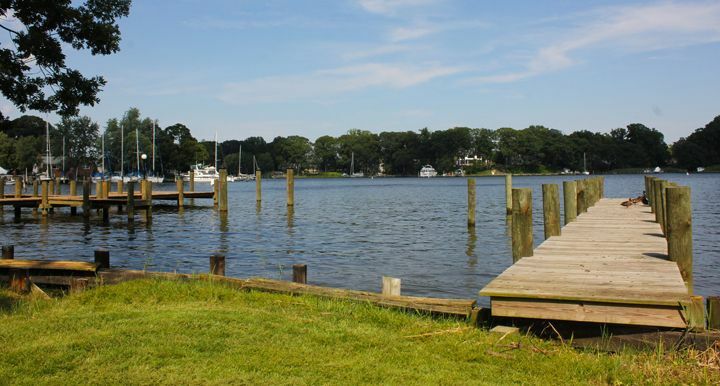 Located on Mill Creek, just around the corner from the Chesapeake Bay, this property has a 24/7 waterfront view. Home was very comfortable in a scenic location. Lots to do in Baltimore, Washington, Annapolis area. Wow, It was all it said it would be! This home is a perfect weekend get away for a family of all adults. Accomodations were perfect for six adults. Location to Downtown Annapolis was excellent. A quiet retreat with plenty of outdoor space for family fun!. We will be back. Marilyn provided us a tremendous house for our Dads weekend getaway. The location is outstanding for uber trips downtown. The house fit our group comfortably. The photos accurately depict this rental. It was very well set up for the family reunion we had on Saturday. The weather held out just long enough to get in some yard games and grill out some wings and ribs. Just the right size for our group. The deck is perfect for sitting, chatting and eating. We were able to set up a canopy in the yard for extra seating. The Oysterman was able to set up on the deck for us to enjoy local oysters. The proprietor was very responsive to questions. Most were answered with instructions located in appropriate places. The location was perfect for access to USNA and downtown Annapolis, MD. The house was very comfortable and accomidated our family nicely. more galleries, museums and memorials than you can see in a day. Contact owner for rate details. 50% Deposit required to secure your reservation.